A large format albumen print showing a young farrier at work shoeing a horse. In true British tradition, two men are actually doing some work while four more are standing around doing nothing. 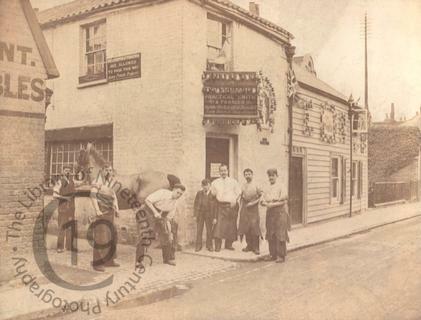 Unfortunately, the name of the farrier on the signage above the entrance is obscured by all the small glass jars containing candles which have been put up as decorations to celebrate the coronation of King Edward VII, which took place on 9 August 1902. A sign on the door (behind the man resting his hand on a boy's shoulder) informs the public that the establishment will be closed 'by royal warrant' on Saturday 9 August, while on the clapboard building next door more jam jars spell out the letters 'E.R.' [Edwardus Rex].